Thanks to everyone who attended the meeting last Tuesday. I really appreciate your dedication to the band program and all you do to help keep it moving forward. For those who weren’t able to attend, here’s a little of what was discussed. In addition to some fun ideas for summer fundraisers, we talked about the Sponsorship Matching Challenge which runs through the end of this month. We can still raise a lot more through this challenge, so please continue to ask for support from your friends, neighbors, and employers. 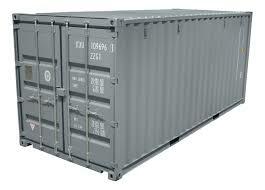 Any amount donated will be matched dollar for dollar. Here is the link to the Sponsorship Drive letter that you can print and distribute. Or send people to the MacBand website to contribute there. On Wednesday, April 17th, the Wind Ensemble will be performing for the district 4th Graders. The elementary kids will be coming to the high school to be entertained and inspired to continue with their musical education. The Jazz Band is going to be busy this month. Here’s what’s on their calendar for the next few weeks. This Saturday, they will be journeying down to Pleasant Hill to perform at the Pleasant Hill Jazz Festival. For those who haven’t had the pleasure of attending this festival, it’s a full day of performances by many of the best jazz bands and jazz choirs at the middle and high school levels. Throughout the day, clinics are held to further the students’ musical education and the evening concert showcases the best of the ensembles and guest entertainment. 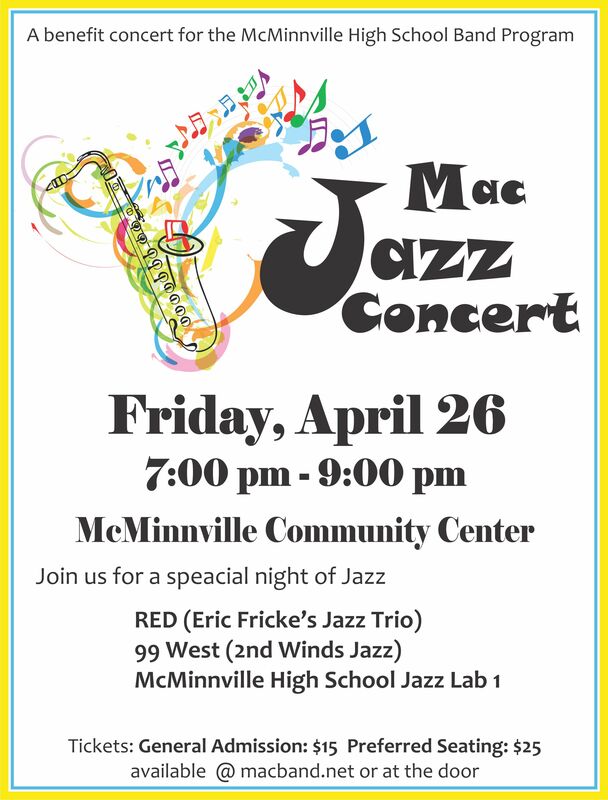 On Friday, April 26th, the first annual Mac Jazz Concert will take place at the McMinnville Community Center. Featuring the MHS Jazz Band, this concert will also include the 99 West Jazz Band (aka Second Winds Jazz Band) and RED (Eric Fricke’s jazz trio). This benefit concert will also include wine tasting by JL Kiff Vineyards. Tickets are available on the MacBand website. Volunteer opportunities are now open to help with this fun event. Click here to add your name to the list. Thanks! And on Tuesday, April 30th, the Jazz Band will head downtown to entertain the crowd at our Friends and Family Night at McMenamins Hotel Oregon. 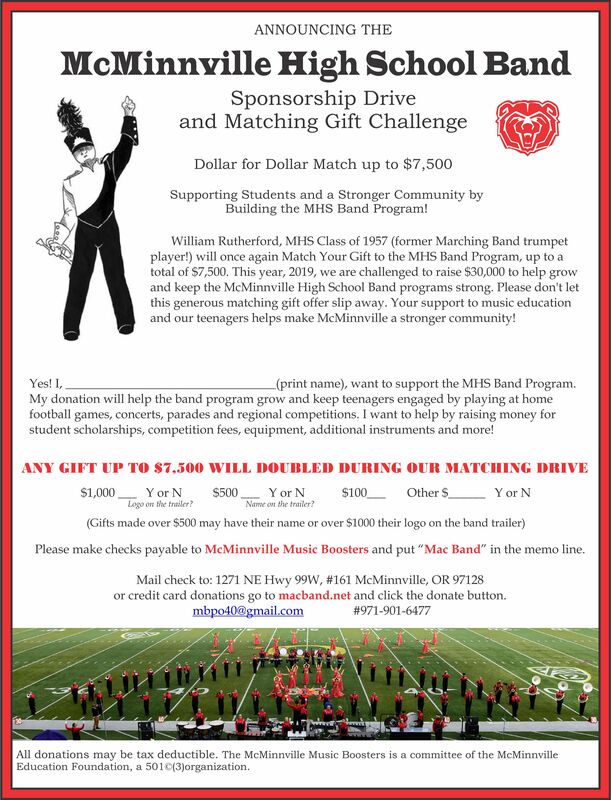 This is one of the easiest and best fundraisers for the band program – all you need to do is come eat dinner and McMenamins gives us money. Be sure to mark your calendar now.